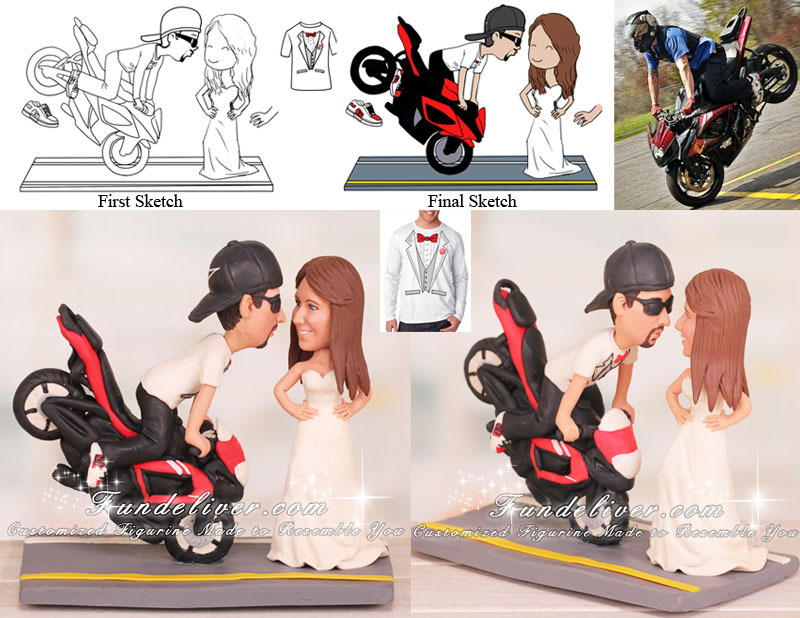 This is a completely customized groom doing stoppie endo front wheelie, kissing bride wedding cake topper ordered by one of our customers. Do you know the stoppie? The stoppie (also known as Endo), is a motorcycle and bicycle trick in which the back wheel is lifted and the bike is ridden on the front wheel by carefully applying brake pressure. It is also sometimes called a front wheelie. They would like the groom to be doing an endo/stoppie/front wheelie on his red/black motorcycle while leaning in kissing the bride. Instead of the groom wearing a helmet, they want him in his Oakley sunglasses with a backward blackish/dark grey hat, white tuxedo t-shirt, black (color he always rides in) pants and white/red/black DC shoes. For the bride, they would like her figurine to be with hair down and a fitting dress while wearing red heels and her hands on her hips with a diamond on her ring finger.